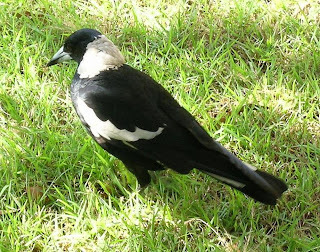 Black-backed magpie (Gymnorhina tibicen), a member of the butcherbird family Cracticidae. Australian magpies are not closely related to the Eurasian true magpies (which are members of the crow family). They are best known for their vibrant warbling songs, and thinly veiled homicidal tendencies. Phot by Don Herbison-Evans. Like them or loath them, there can be little argument that the introduction of molecular methods in the latter part of the last century revolutionised the study of phylogeny and evolution. In many cases, the results of molecular studies supported the theories already proposed about which taxa are related to which, and how. In other cases, molecular data came up with results that strongly contradicted what we thought we already knew. And in some cases, molecular studies gave results that had never been suggested before, but seemed perfectly reasonable in hindsight. Black-headed gonolek (Laniarius erythrogaster), a member of the African bush-shrike family Malaconotidae. Photo by Derek Ramsey. I have spoken elsewhere about the new picture of oscine (songbird) phylogeny which has arisen from molecular studies of the group. I'd recommend reading the second and third paragraphs of the post I've just linked to for the background to what I'm just about to talk about. Let it suffice to say that most of the Holarctic families of oscines belong to a clade called Passerida, which is nested within a series of mostly Australo-Papuan clades. Of these Australo-Papuan clades, the most diverse is the Corvoidea, which also includes a number of taxa that have dispersed outside of Oceania such as the crows and orioles (the proper Old World orioles, that is, not the American birds known as 'orioles' which are not orioles at all but members of the Passerida). Also included in the Corvoidea are the shrikes, Old World birds with hook-tipped bills that are more predatory than your average songbird. 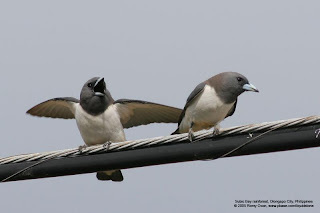 White-breasted woodswallows (Artamus leucorynchus). Photo by Romy Ocon. In 2004, Barker et al. published a phylogeny of the oscines that resolved a number of clades within the Corvoidea. 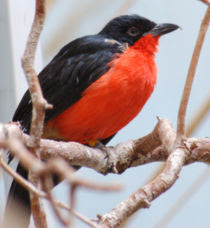 Among the most interesting clades identified by this study was one that united the bush shrikes (Malaconotidae) and helmet-shrikes (Prionopidae) of Africa (both previously counted as subfamilies of the Laniidae) with the woodswallows (Artamus) and butcherbirds (Cracticidae) of Australia. This was definitely one of the third class of molecular results that was unexpected but sensible, as the cracticids are in many ways the shrikes of Australia. The new clade, which lacks a name but which for convenience I'll dub the 'malaconotoid clade', therefore combines many of the world's shrike-like birds in one convenient package. The notable exceptions are the true Eurasian shrikes of the stripped-down family Laniidae, which are Corvoidea but whose affinities seem to lie elsewhere as the sister group of the crows, and the Asian shrike-babblers of the genus Pteruthius, which Reddy and Cracraft (2007) showed to be corvoids related to the American vireos. 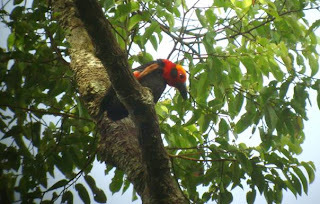 Bornean bristlehead (Pityriasis gymnocephala). Authors had disagreed continuously over the years about whether Pityriasis was related to the shrikes or the cracticids - a somewhat ironic argument since the recognition of the malaconotoid clade. Photo by James Eaton - photos of this retiring bird are few and far between, making this all the more impressive. Comparison with the other corvoids suggests that the malaconotoids had an Australian origin, a suggestion corroborated by the fact that the basalmost split in the group seems to be between the Australian taxa on one side and the African taxa on the other (Barker et al., 2004; Moyle et al., 2006). As with all good scientific theories, this brings up a further question - how did the malaconotoids get from Australia to Africa? To answer this question, it turns out that a collection of small southern Asian families also fall into the malaconotoid clade - the Platysteiridae, the ioras of the genus Aegithina, and the unusual Bornean bristlehead (Pityriasis gymnocephala). The reasonable suggestion might therefore be made that southern Asia was used as a corridor by the malaconotoids on their way to Africa. Unfortunately, the evidence is a little more equivocal in this regard. It is true that the Asian taxa sit on the African side of the malaconotoid clade (Moyle et al., 2006 - Fuchs et al., 2006, found Aegithina to be sister to the Australian taxa, but with low support), but there is no clear division between taxa from the two continents. Instead, the African and Asian taxa are mixed together, suggesting more than one dispersal between the continents and also unclear whether dispersal was from Asia to Africa or vice versa. The other significant dispersal in the history of the malaconotoids was from Africa to Madagascar, where an ancestral malaconotoid gave rise to the vangas (Vangidae). The vangas were one of the very few oscine groups to reach Madagascar, and once there they formed an island radiation comparable to the honeycreepers of Hawaii or the finches of the Galapagos. While there are only twenty-one species of vanga, the group is spectacularly diverse ecologically, as shown above in a figure from Yamagishi et al. (2001) - so much so, in fact, that many of the species had been assigned to separate families and were only recognised as vangas recently (see Don Roberson's page on the family for further details). Notable in this regard are the handsome sickle-billed vanga (Falculea palliata), the coral-billed nuthatch (Hypositta corallirostris) which bears an uncanny resemblance to the unrelated true nuthatches, and the large-billed helmetbird (Euryceros prevostii). Barker, F. K., A. Cibois, P. Schikler, J. Feinstein & J. Cracraft. 2004. Phylogeny and diversification of the largest avian radiation. Proceedings of the National Academy of Sciences of the USA 101: 11040-11045. Fuchs, J., J. Fjeldså & E. Pasquet. 2006. An ancient African radiation of corvoid birds (Aves: Passeriformes) detected by mitochondrial and nuclear sequence data. Zoologica Scripta 35 (4): 375-385. Moyle, R. G., J. Cracraft, M. Lakim, J. Nais & F. H. Sheldon. 2006. Reconsideration of the phylogenetic relationships of the enigmatic Bornean bristlehead (Pityriasis gymnocephala). Molecular Phylogenetics and Evolution 39 (3): 893-898. Reddy, S., & J. Cracraft. 2007. Old World shrike-babblers (Pteruthius) belong with New World vireos (Vireonidae). Molecular Phylogenetics and Evolution 44 (3): 1352-1357. Yamagishi, S., M. Honda, K. Eguchi & R. Thorstrom. 2001. Extreme endemic radiation of the Malagasy vangas (Aves: Passeriformes). Journal of Molecular Evolution 53: 39-46. Interesting post! I didn't know that Vangidae had recently been enlarged. To me, passeriforms look just as confusing taxonomicallly as angiosperms (although, of course, on a smaller scale). Although I think that part of the reason why the molecular phylogeny of passerines was so unexpected was that only very few anatomical studies had been made, and passerine taxonomy still largely relied on superficial similarities when the Sibley & Ahlquist studies came out. I've read Gadow (1893), and he quite clearly recognised the problem, and even realised the Australian origin of passerines. But many people simply believed that passerines were basically all the same anyway, and the classical works on anatomy and classification of birds only said very little on passerines, and often claimed that it would be best to place them all into one family. So I gues a large morphological analysis of passerines would probably confirm at least some of the molecular results that contradict the traditional classification. Although I think that part of the reason why the molecular phylogeny of passerines was so unexpected was that only very few anatomical studies had been made, and passerine taxonomy still largely relied on superficial similarities when the Sibley & Ahlquist studies came out. I'd quite definitely agree with you there. Passerine taxonomy had largely consisted of separating out the groups that were obviously distinct, such as larks and swallows, while the families Muscicapidae, Sylviidae and Timaliidae, which together I think accounted for over half the passerine species, functioned as dumping grounds for everything that looked more generic. Notably, most of the shuffling between families has occurred with taxa previously assigned to those three garbage bins. For the most part, the morphologically better-defined families have remained largely inviolate - a swallow is still as much a swallow in 2008 as it was in 1908 - though ideas may have changed somewhat about how these forms are related to each other. I'm a little more skeptical about whether a morphological analysis would recover the molecular groupings, but then, I'm not aware that anyone has yet tried. Anyone have a spare lifetime to spend? Notably, most of the shuffling between families has occurred with taxa previously assigned to those three garbage bins. Of course, about the most comically confusing shuffle that has had to be made has been the discovery that the type genus of Sylviidae, Sylvia, is more closely related to taxa assigned to the Timaliidae than it is to taxa previously regarded as Sylviidae. This would mean, confusingly enough, that what was Timaliidae would have to become Sylviidae (the latter name having priority), while Sylviidae would include only about ten of the well-over-300 species previously regarded as sylviids. "Passerine taxonomy had largely consisted of separating out the groups that were obviously distinct, such as larks and swallows, while the families Muscicapidae, Sylviidae and Timaliidae, which together I think accounted for over half the passerine species, functioned as dumping grounds for everything that looked more generic." Indeed. Especially Timaliidae was essentially a wastebasket. As Ernst Hartert rhymed: "Was man nicht unterbringen kann, sieht man als Timalien an." (If it can't be classified, it is regarded as a babbler). Something like the Saxifragaceae of birds. "I'm a little more skeptical about whether a morphological analysis would recover the molecular groupings, but then, I'm not aware that anyone has yet tried." It probably wouldn't recover all of the molecular groupings, but maybe some of them. The James et al. (2003) paper on Pseudopodoces at least has a small osteological analysis, with a creeper/wren/gnatcatcher clade, Aegithalidae closer to sylvioids than to Paridae, etc. It was tried in angiosperms by Nandi, Chase & Endress (1998) and their non-molecular analysis got some results that agree with the molecular ones, but were previously unsuspected. So it might work for passerines too. "This would mean, confusingly enough, that what was Timaliidae would have to become Sylviidae (the latter name having priority), while Sylviidae would include only about ten of the well-over-300 species previously regarded as sylviids." Unless Sylviidae would be expanded to the entire clade Sylvioidea, but that would of course include many other taxa that weren't in Sylviidae before, even swallows. I wonder whether Sylviidae has priority over Hirundinidae.